This Area 51 panorama was taken by Jeff Gregos from Tikaboo Peak on Friday, August 13, 2010. Publication here with friendly permission. Click here for the Trip Report of Jeffs hike. Click in the preview below to download the full-size version. The most notable change is a new, fairly large hangar at the South Ramp (see details below). Our 2009 satellite image shows the beginning construction, just west of the H20-23 storage building. Notice the two large dish antennas at the north end of the base. One of the dishes is pointed into the RCS range, which is a common direction when the dishes are in use. The other dish, however, is pointed in an unusual direction, further south. 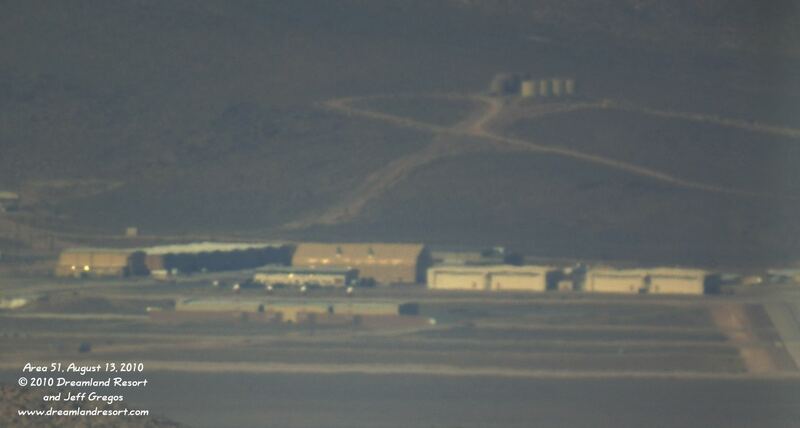 It appears to point roughly in the direction of the Groom Lake Road guard shack. Jeff also caught a Janet taxiing for take-off on runway 14. Since the panorama was assembled from multiple individual photos, the Janet shows up in several places. The large hangar in the center was constructed between November 5, 2009 and May 24, 2010. Beginning construction for the foundation can be seen in our 2009 satellite image. Most new construction at Area 51 is centered around the South Ramp, which seems to be the most active part of the base at this time. The dish antenna behind the Janet is pointed into the RCS range. The other dish, however, is pointed further south. 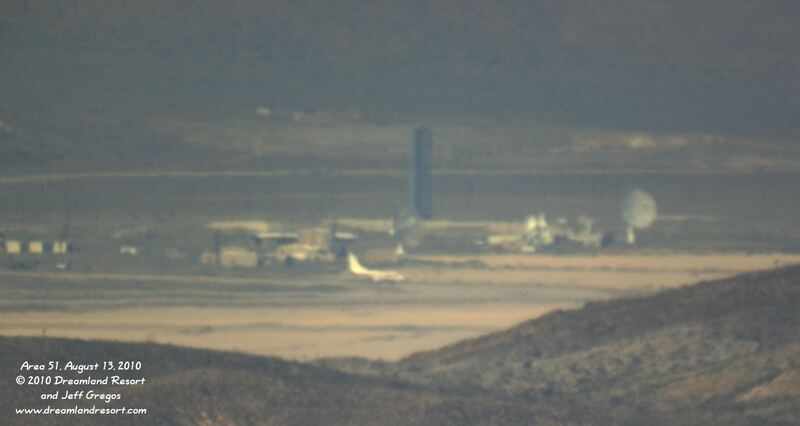 It appears to be pointed in the direction of Bald Mountain or the Groom Lake Road guard shack. Jeff did not notice any flying activity that could explain the direction of the dish. But after a while both dishes moved back to their "park" position, pointing straight up.